Home / News / Showbiz / Viral / The Health Condition That Took The Life of Isabel Granada, Learn How To Prevent Aneurysm! 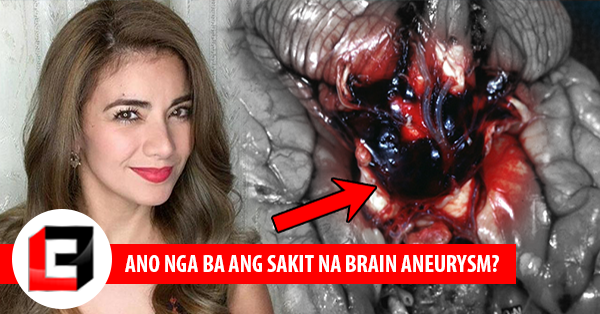 The Health Condition That Took The Life of Isabel Granada, Learn How To Prevent Aneurysm! The sudden death of Isabel Granada at the age of 41 left people in shock and regretful for the life of this Filipina singer-actress. Isabel Granada looked fit and might have a healthy lifestyle, that the cause of her death made people become more vigilant and aware of their body and cautious of this silent killer. To address this sudden panic, Doc Willie Ong uploaded a video that talks about Aneurysm its types and symptoms and ways to prevent this. It is noted that Aneurysm does not only occur in the brain of a person but also in their stomach. An aneurysm is caused by a sudden enlargement of an artery in the brain that will cause weaken the arterial wall that will lead to the rupture of the artery that may lead to internal hemorrhage that may result in the patient’s death. There are available surgery that can be performed to the patient if diagnosed early, but a ruptured aneurysm is fatal. Common symptoms of an aneurysm are very hard to identify unless the artery already ruptured. One may experience a severe headache, chest or back pain, blurry vision, or nausea and vomiting. The risk factors or people who are prone to this condition are those who have hypertension, tobacco/cigarette smokers, diabetes, age over 40, family history. To prevent this kind of condition, one should regularly monitor their blood pressure of 120/80, regular exercise, quit smoking, and a balanced diet. Life is so precious that each one of us has the privilege to enjoy every moment of our life, let us not waste it to an unbalanced diet and unhealthy lifestyle, instead let us learn how to take care of our body to enjoy a longer life.